“There are no good pirate games for the Genesis!” This seems to be the popular argument among many Genesis gamers and collectors, and it could not be further from the truth. While there are less pirate titles for the Genesis than for the NES, there is a handful of absolutely amazing titles that outclass many official releases and push the hardware to its limits. Most of these games have been developed by one of three pirate development teams: Never Ending Soft, Gamtec (yes they really spell it like that) and ChuanPu Technology. All of these developers shared team members and it is difficult to tell where one company ends and the next one begins, or whether they are even different companies or just aliases for the same entity. Their structure may be unknown, however what is clear is that the quality of their products is outstanding. All of the following games feature outstanding gameplay and graphics that seemingly transcend the Genesis’ limited colour palette and leave the gamer begging for more. So, avast ya scurvy curs! It’s time to see pirates at work! Developed by Never Ending Soft Team and released in 1996 in China, and re-released in 1999, this game can almost pass off for an officially licensed title. It uses a lot of original content, and while it plays like a typical 16-bit brawler, it really is one of the best for the system featuring fantastic graphics, tight controls, excellent in-game physics and wonderfully animated characters. This truly is some of the best pirate work out there…. and pirated work it is. While this title does feature more original content than the average pirate release, it also uses a lot of stolen content, especially in the sound department. Most notably the main title theme is a port of Terra’s theme from Final Fantasy VI, many of the voice samples are ripped from Streets of Rage and the entire sound driver is from High Seas Havoc. With all that excellent source content one would think that this game has fantastic audio, but unfortunately that really is its weakest feature. The music and sound effect volume varies greatly between levels, to the point where you have to adjust the volume on your TV when playing. It’s not a huge deal, but it almost feels like Never Ending Soft Team would’ve been better off just developing its own sounds. Oh well, it’s a small blemish on an otherwise awesome game. Set in ancient China, the game allows the players (one or two-player compatible) to choose one of three heroes: a strong but slow axe wielding grunt, an agile but weak battle maiden and a well-rounded, sword-wielding typical hero type. All three of them are well-balanced within the game and have various strengths and weaknesses that can be exploited during gameplay. The heroes have a nice array of attacks and special moves that can be strung into devastating combos. 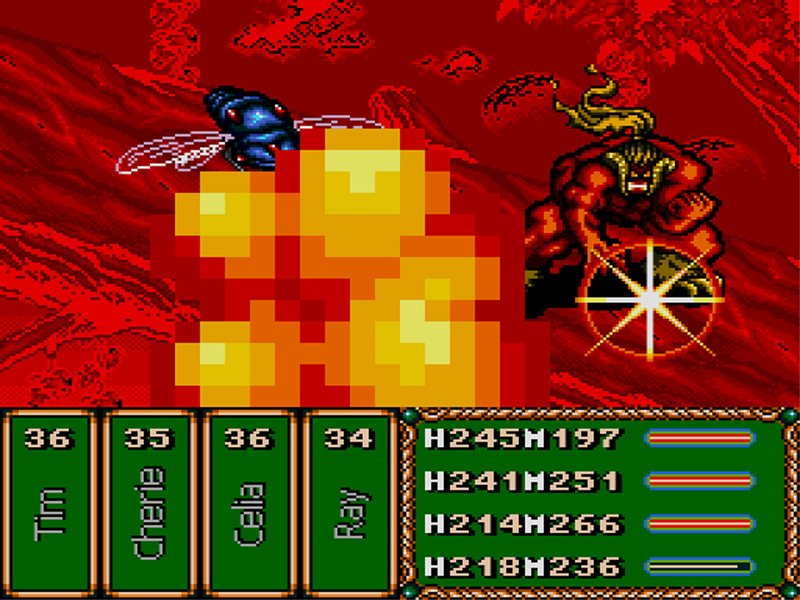 However where the combat really shines is the absolutely amazing magic spells. These are randomly generated one time use items that are picked up along the adventure and are basically a variety of screen clearing elemental attacks ranging from lightning, fire, ice and rock based spells. They look absolutely stunning and are invaluable to the gameplay. 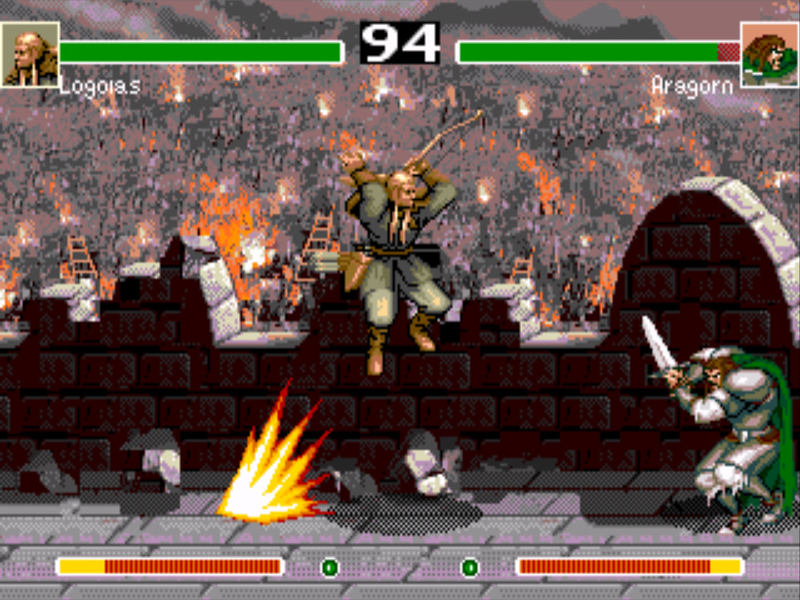 Other high points of this game include the well crafted combat system, which features flawless hit detection (much better than in many official brawlers) and support for many sprites onscreen. In fact, sometimes you’ll get so swarmed by bad guys you’ll forget that you’re playing a Genesis game and think you’re standing at an arcade cabinet. There are also nice cut scenes between levels that feature detailed static pictures and scrolling text that reveals the story, albeit in Chinese. The pictures however are well done and do a decent job of revealing much of the plot, so no knowledge of Chinese is required to enjoy the game. Much more praise can be given to this title, which can be read in the official Sega-16 review. 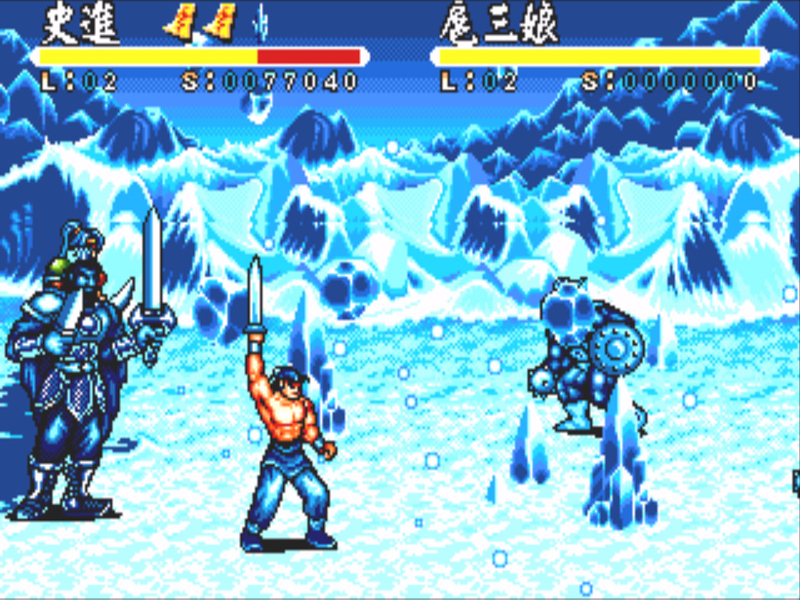 The bottom line is that Shui Hu Feng Yun Zhuan is one of the best 16-bit brawlers and can stand on par with legendary titles like Streets of Rage and Final Fight. Any fan of the genre would be a fool to dismiss this game just because it is an unlicensed production. (AKA: Barver Battle Saga: Tai Kong Zhan Shi, Russian Final Fantasy, Barver Battle Saga: Legend of the Space Fighter, and who knows how many others.) This is possibly the most extensive effort in pirated game production; Brave Battle Saga offers an immersive role-playing experience that lasts for a good 25 to 30 hours of role-playing game-time. Produced by Taiwanese pirates ChuanPu Technology it was originally released in 1996 in China and Taiwan. Brave Battle Saga is THE definition of pirated content, being composed almost exclusively of elements lifted from other games including: Secret of Mana, Breath of Fire 2, Romancing SaGa 3, Final Fantasy VI and various other Squaresoft RPGs. However, the quality of the stolen source material really shines through, and the end result is a gorgeous game with excellent gameplay mechanics and an entertaining, albeit somewhat typical J-RPG story…You know just like Squaresoft would’ve made back in the ’90s. The story is your typical Japanese RPG (despite not being made in Japan): young hero embarks on an adventure, makes friends along the way and saves the world from a profound evil. We’ve seen it before,; however, there are some unexpected twists in the plot and the characters and game world are interesting enough. The adventure is fairly linear, but this is countered by the massive size and labyrinthine nature of the dungeons, which allows for a lot of exploration and treasure hunting for hidden goodies like secret magic spells. 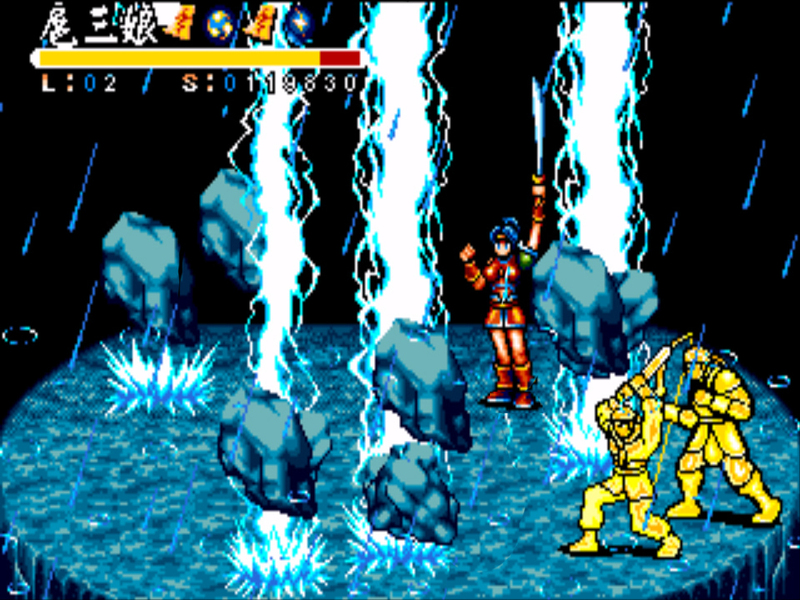 Enemies can be seen walking around in the environment and can thus be avoided. Due to all the pirated content though, the enemy sprites seen on the map look different than how they actually appear in battle. It’s a little bizarre to see at first, but you soon get used to it, and being able to dodge some random fights is a nice touch. The combat environments themselves look amazing and feature large sprites, highly detailed arenas and epic enemies. The magic casting system is one of the best features in the game. Magic can be equipped to any player character in a fashion similar to armour and weapons, this allows for a lot of flexibility and character customization, and tactical gameplay. The spells themselves look absolutely phenomenal. They start off with basic elemental magics and move up to fantastic summon spells that look so impressive it’s hard to believe they’re in a Genesis game. Essentially Brave Battle Saga is a mid ’90s Squaresoft RPG that wasn’t made by Square. If you ever felt like you were missing out on many gorgeous RPGs by being on the Sega side during the 16-bit console wars, then here is your chance to get back at Square and Nintendo. It’s almost like a montage of the best SNES RPGs, and monstrous copyright violations aside Brave Battle Saga is a great game. 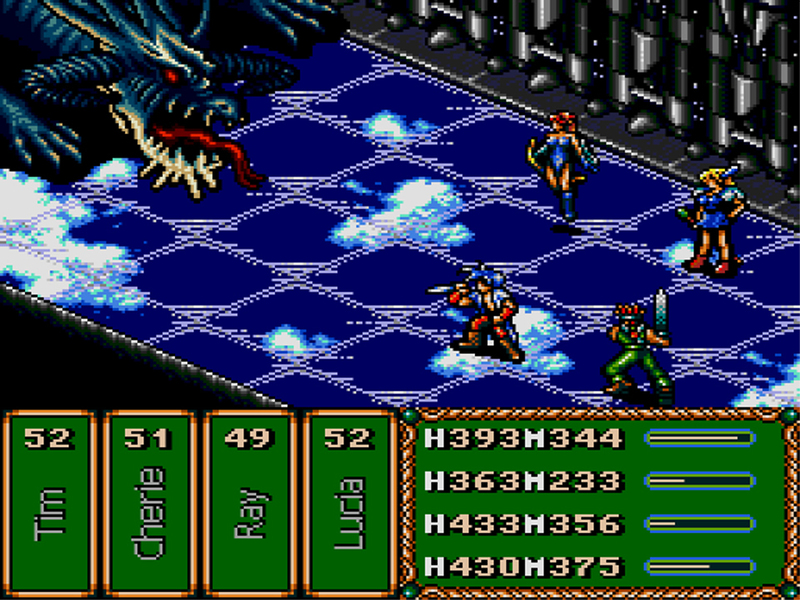 It stands up as one of the best role-playing games on the Genesis, falling just short of the quality of the greats like Phantasy Star IV and Pier Solar. Don’t let that discourage you though, this may very well be the third best RPG on the system! 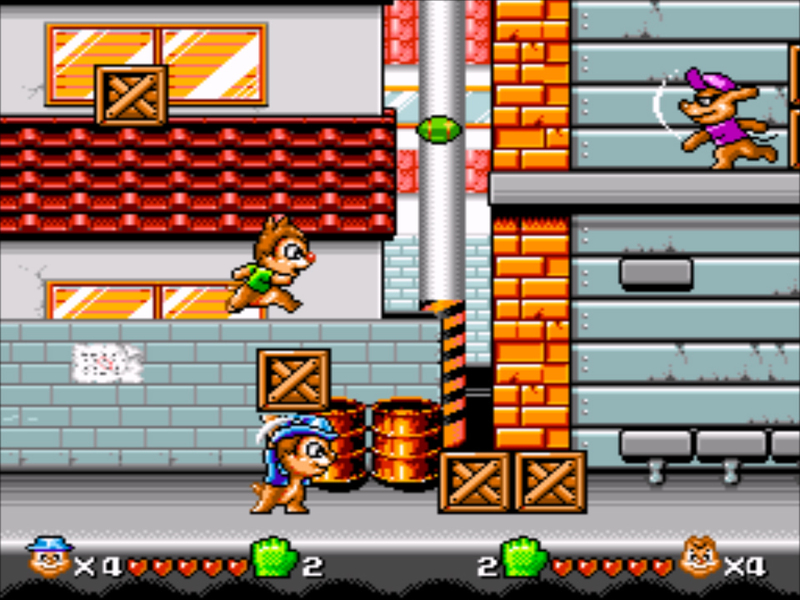 Created by Gamtec; Squirrel King is what people think of when they hear “pirate Sega game”. This game instantly comes to mind for good reasons. For one, it’s a great game! Squirrel King is a genuinely fun action-packed side-scroller loaded with awesome graphics, smooth gameplay and great music. Unlike many pirate productions that are so poorly programmed they’re no fun to play, look at, or even talk about (as the conversation will degenerate into excessive uncouth vulgarity), Squirrel King is a genuinely fun experience for one or two players. On the surface the game may look like an upgraded port of the NES classic Chip ‘N Dale: Rescue Rangers but past the first level it becomes obvious that it is much more than that. It features the famous chipmunks Chip and Dale as the star characters (or rather slightly off-looking pirate versions of them that I like to think of as Chap & Dill). The graphics in the game are lively and colourful, once again making it seem like pirate devs somehow knew a secret way to circumvent the Genesis’ limited colour palette. 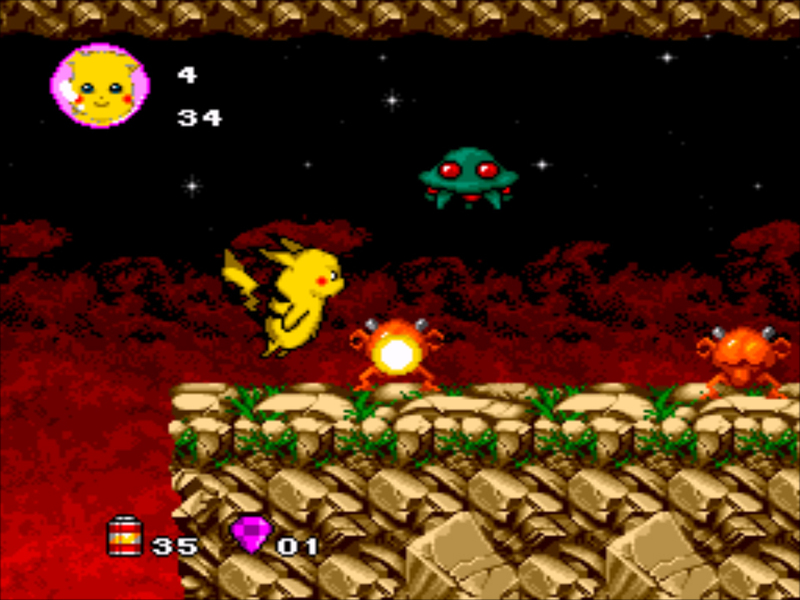 The high action side-scrolling gameplay is polished and the levels are expertly laid out, although very challenging towards the end of the game. Player and enemy sprites look great and are nicely animated, and there are some big bosses to battle and marvel at. The gameplay formula is simple and similar to the NES game: C button jumps, B picks up and throws crates and A launches a special fireball of which you get a limited quantity. This classic, timeless formula is well executed, and while it can make this game appear easy Squirrel King is anything but. Level designs become increasingly challenging as you progress through the game, and while the later levels are quite challenging, requiring some precise platforming skills and quick fingers, the difficulty never feels cheap. The game never kills you with something that you can’t conquer with more practice, and that sort of difficulty counts for a lot when it comes to a lasting fun factor. The other reason for this game’s popularity is that it is one of the most common pirate titles in circulation. It frequently shows up in sale threads on message boards and on auction sites and rarely goes for more than $20. It is in fact, so popular that it was shamelessly pirated into another game – the pirate Super Mario World for the Genesis. Unfortunately, whoever did that hack job was nowhere nearly as skilled as the creators of Squirrel King. It plays rather poorly with strange physics and an odd assortment of levels that range from stolen Super Mario content to Squirrel King levels with butchered colour palettes. It’s best to avoid that game and stick to the original Squirrel King which would make a fine addition to any Genesis collection. While the developer and publication date of this one are currently unknown, it is believed to be another fine creation by Gamtec. Unlike many pirate titles that use licensed characters and titles only to have absolutely nothing to do with them in the game (ie: the Russian Metal Gear Solid pirate); Super Bubble Bobble MD is an actual Bubble Bobble game just like the official Taito creations, but for the Sega Genesis. The game seems to be loosely based on the NES classic with much improved graphics, sound and extra characters. 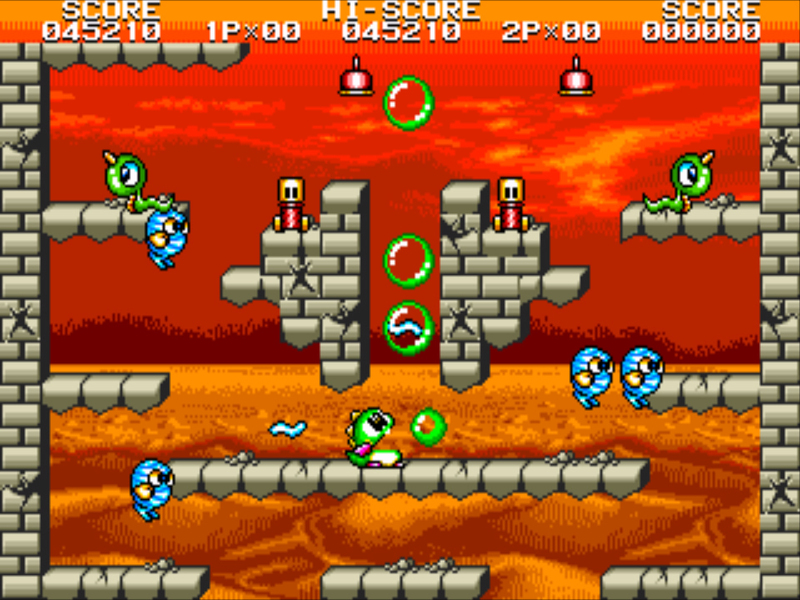 Some elements appear to be taken from or at least largely inspired by Bubble Bobble Old and New for the Gameboy Advance, while others, like most of the music are remade compositions of the NES tunes. The musical compositions sound fantastic on the Sega hardware and include some of the catchiest game tunes on the system; especially noteworthy is the boss theme. 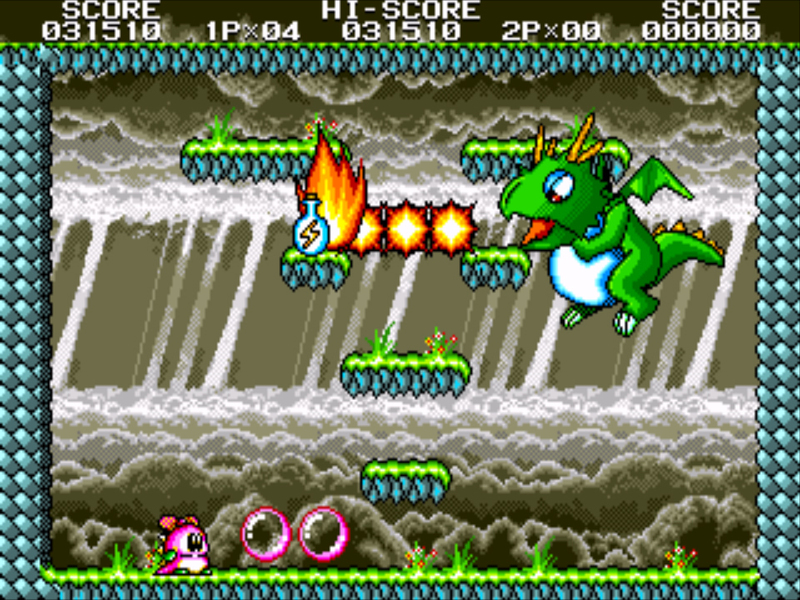 The gameplay itself is the standard Bubble Bobble fare – navigate a cute little dragon through a one screen maze and blow bubbles to capture enemies, then pop them to gain food items for points. This gameplay mechanic has not only been ported flawlessly to the Genesis, but a few additions were made to make it even sweeter. You can hold down the B button to inflate your dragon and make him float like a balloon. It’s a simple addition but it adds a lot of strategy to the game since when you float to the top of the screen you loop around and come up the bottom – very useful for boss fights and avoiding swarms of enemies. Furthermore, since pirate game developers aren’t concerned with copyrights; they added two new characters to the mix. Now in addition to Bubby and Coro (the two dragons) you can also play as anime poster cat Doraemon and Cryon Shin Chan. They control exactly the same as the dragons but are a nice addition and bring some variety to the game. Also in an unusual display of attention to detail, the developers programmed individual animations for each character that they display when you don’t touch the controls for a few seconds. Overall Super Bubble Bobble MD is a fantastic game by any standard. With many great features like brilliant graphics, scrolling backgrounds, catchy music and addictive gameplay this may very well be the best Bubble Bobble game out there. Like in Sonic the gameplay in TTA3 is very simple: run around and jump on the enemies. You can sprint by holding down the A button, and you jump with B. It’s that simple, and with this simplicity comes some elegance. The game controls very well and the familiar formula makes it easy to get into. You get to stomp on some bad cartoon animals that have turned against you and sometimes you jump on crates and garbage cans to free imprisoned friends. 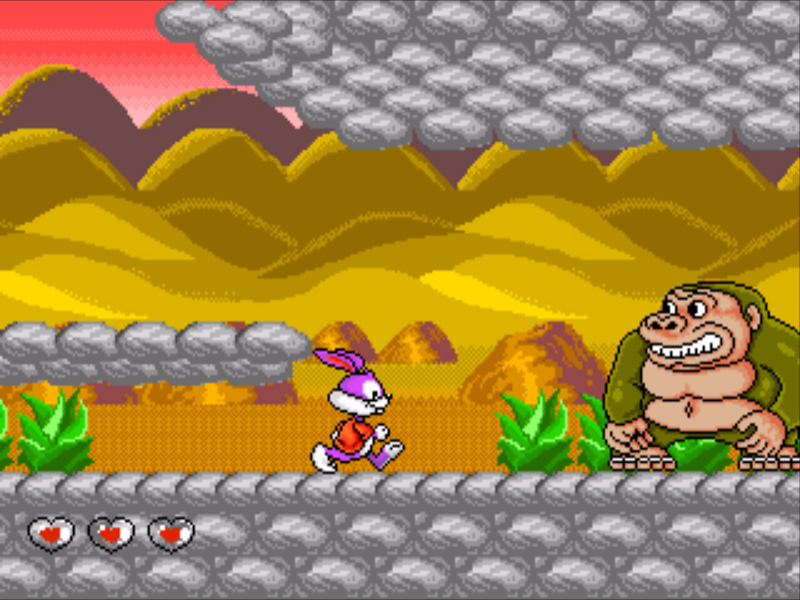 Each level ends with a boss, the first of which is a giant ape that looks an awful lot like Donkey Kong. 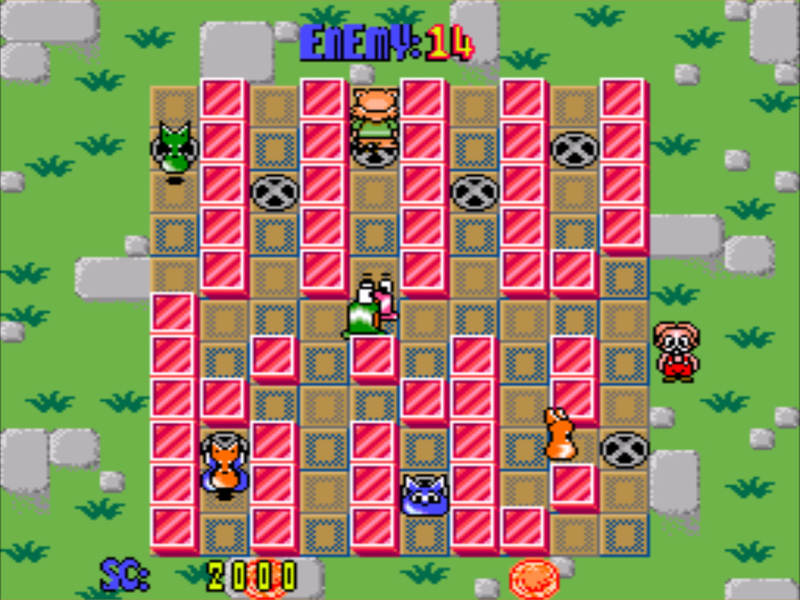 The most interesting thing about this game is that it very obviously uses tiles, backgrounds and enemies that look like they belong in Super Mario World, including Koopa Troopas and Monty Moles. The key term here is “look like.” Unlike most pirate games that just rip the sprites directly form the source material, in TTA3 someone actually went through the trouble to painstakingly create new, “original” sprites that look like they came from Super Mario World, but aren’t actually ripped from there. It’s the same case with some of the level tiles and backgrounds, they have all been recreated to look like elements from Super Mario World, with the occasional objects being influenced by Sonic The Hedgehog levels. 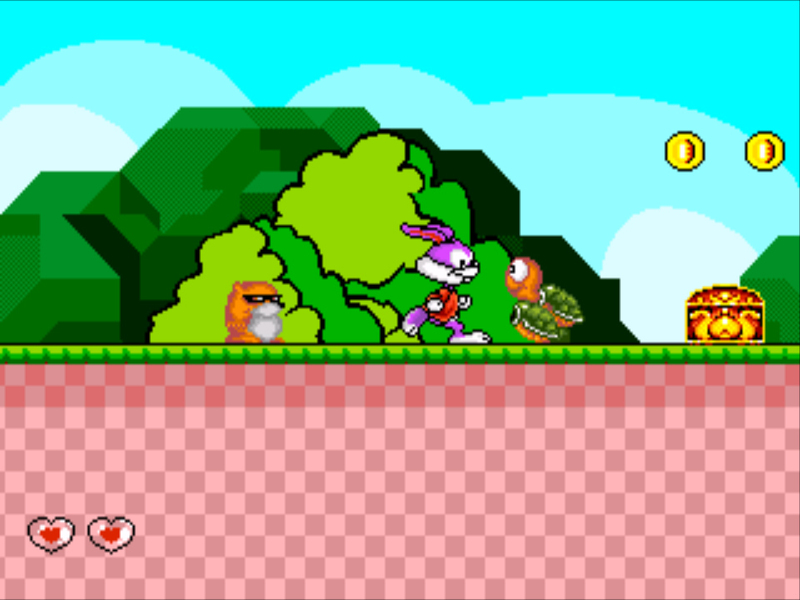 Overall Tiny Toon Adventures 3 is colourful and fun. It’s not the longest game around, a full playthrough will take under an hour, maybe a little more on the first run. The graphics however are charming, and the faux Mario and Sonic elements give the game an ironically original feel. The music can be annoying and tinny at times, but it’s not overly bad and it’s nothing new for a Genesis title. In the end it’s a fun little side-scroller that shouldn’t be passed up. (AKA Huan Le Tao Qi Shu, aka Supper Healty Americanrat) Developed by a group of programmers that have been associated with ChuanPu Technology, it is believed that Smart Mouse was also created, or mostly created by said company. Unlike ChuanPu’s other major development: Brave Battle Saga, Smart Mouse is a much simpler affair. 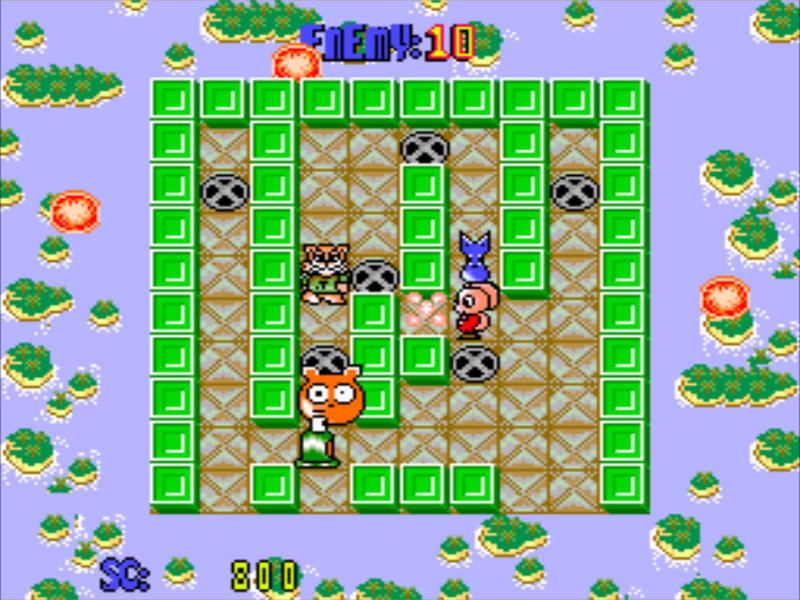 In terms of gameplay it strongly resembles Pengo with occasional Bomberman elements. Unlike in Pengo, however, the objectives in Smart Mouse are much more intuitive. All you really have to do is survive! You are a small mouse trapped in a maze with some cats and monsters. You can push the blocks that make up the maze to squish your enemies as they actively search for you. Once you’ve killed them all the level ends and you advance to a more difficult maze. Each level is also timed and if you don’t dispose of the enemies in time then they start to leave and you lose points for the missed baddies, however you do get to advance to the next stage. Survival really is the key here. Occasionally you come across bombs hidden inside the blocks, these can be used to blow stuff up in a Bomberman-like fashion. All the in-game art is original to the release, but as with Shui Hu Feng Yun Zhuan the sound is pirated, with the engine coming from Wonder Boy III: Monster Lair and some of the songs originating from Capcom’s Don’t Pull. The graphics are simple and clean, and aren’t too distracting from the frantic gameplay. Smart Mouse becomes genuinely challenging as the game progresses and the challenge is even more fun with two players. It’s a good thing that this game features password saving. Smart Mouse is a simple game, but it is another fine example of simplicity done right. The following pirate games are all interesting attempts, and while they’re not necessarily bad games, they fall just short of reaching greatness and making the list of top-tier pirates. For the most part, they are all very minimalistic, lacking anything past the bare bones of their genre. They work, and there is some fun to be had in playing them, but past a cheap way to spend a half-hour they offer nothing to make them stand out of the crowd. There’s something fascinating about seeking an iconic Nintendo character like Pikachu star in a game for the most prominent Sega system. It’s like reality itself has somehow been warped. This is the main draw of Pocket Monsters for the Genesis. 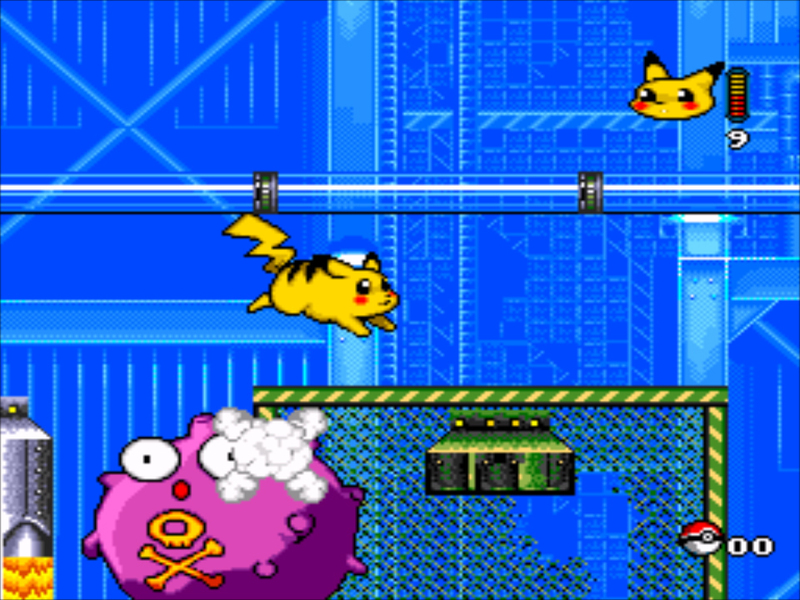 Developed by unknown pirates, at an unknown time, possibly on a tall ship in international waters, Pocket Monsters is a simple sidescrolling adventure starring Nintendo’s billion dollar electric rodent. 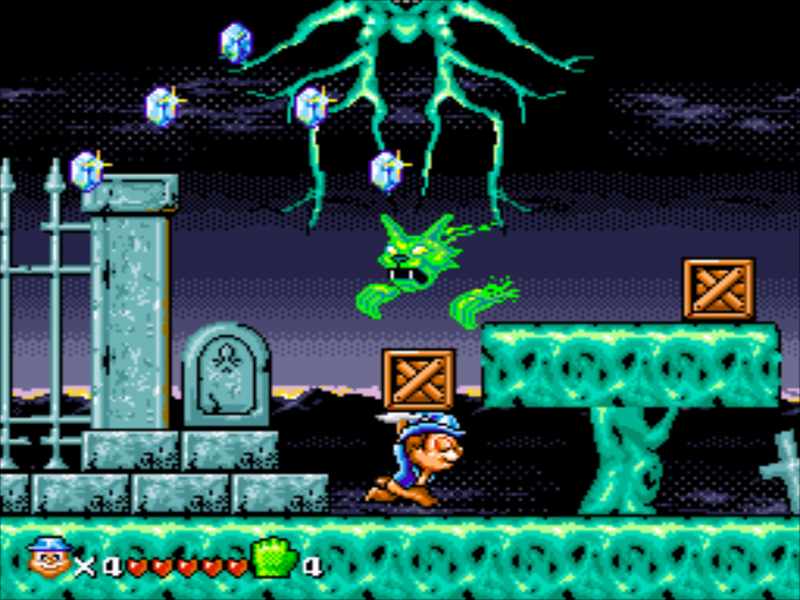 The game is a straightforward side-scrolling adventure featuring just the basics of the genre: jump on enemies, collect items for points and fight the occasional boss. No bells and whistles here, and while simplicity can be a good thing if the gameplay is polished (ie: Squirrel King), that’s just not the case with Pocket Monsters. The controls feel floaty and some of the platforming can be downright frustrating with many blind jumps that often end in bottomless pits, and moving platforms that don’t always synch up properly making you have to backtrack away from the screen to reset them. There are some nice touches like Pikachu’s electric attack, but unfortunately he’s battery powered. You literally have to collect batteries in order to save up enough power to unleash the fury, and while this may seem a little clever at first, there just aren’t that many batteries lying around. You’ll maybe get to use this attack three times throughout the entire game, if you’re lucky. Pocket Monsters isn’t a terrible game. It has some nice features like digitized cut-scenes that look like they’re right out of the cartoon. However, the gameplay ranges from bland to annoying, and some of the enemies you face will leave you scratching you head. Oddly enough, this pirate is also available for the SNES, and in an ironic twist the Genesis version is somewhat better featuring an extra boss, larger boss sprites and better music. 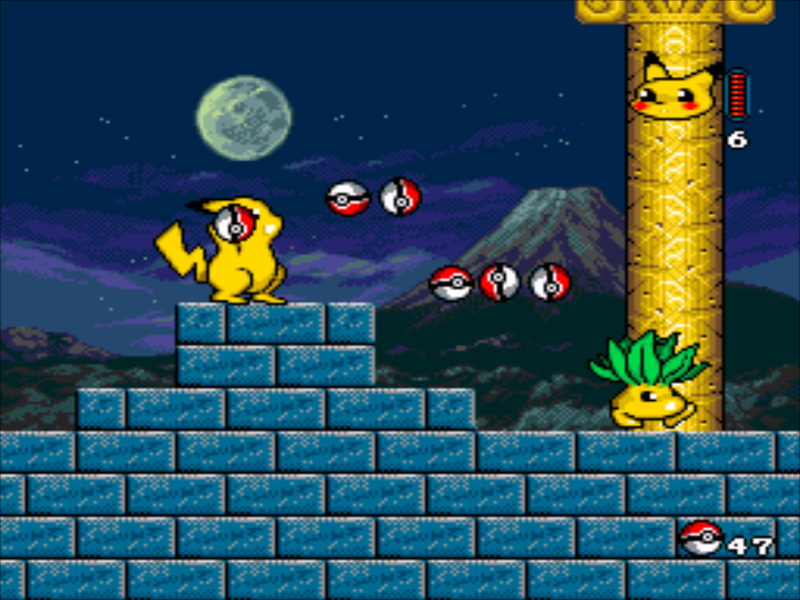 (AKA Pokémon Yellow) This is another sidescroller starring that lovable Pikachu. Whether this game was developed by the same people who made the first one isn’t entirely clear. Regardless, it is a big step up from the predecessor. 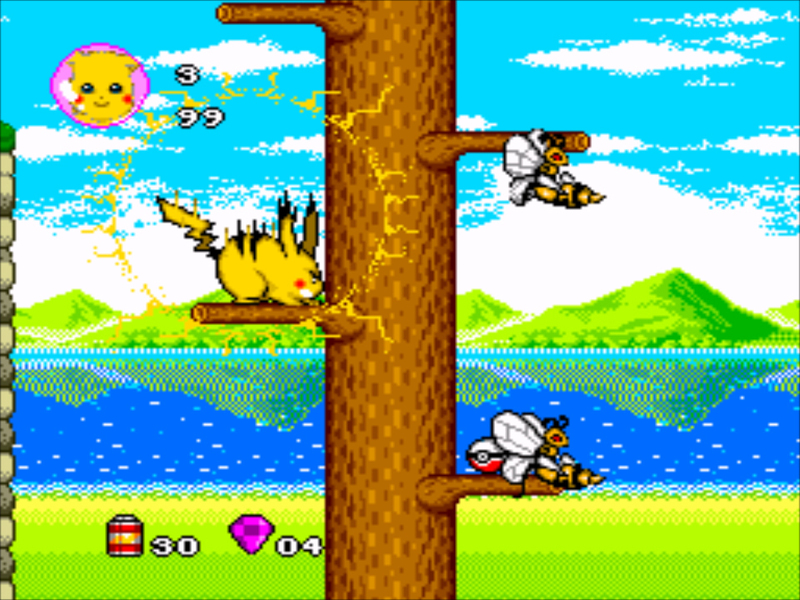 Like the first game, Pocket Monster 2 is a straightforward side-scrolling adventure. This time around though, there are vast improvements in terms of level graphics and character sprites. Most notably, Pikachu looks a lot better. He is nicely animated and looks great in the game environment. Likewise, the enemies take a turn for the better. This time around they are actual Pokeémon and look like they belong in this game. The stage layouts are also much better. There are none of the annoying blind jumps that plagued the first game, and the controls themselves are tighter, making the platforming aspects of the game more fun. Lamentably, the problem with badly-synched mobile platforms returns in a few areas, providing some evidence to the theory that this game was developed by the same people who made the first one. For some bizarre reason Pikachu has been neutered of his electrical attack. Instead, he can now throw pokeballs at enemy Pokémon to get rid of them… Pokémon catching other Pokémon, seems somewhat cannibalistic… and controlling a Pikachu that can’t shoot lightning is a little sad. Those issues aside, the game plays well and features some very catchy music, especially in the first level. Despite the many improvements Pocket Monster 2 still falls a little short of greatness. The gameplay mechanics are mostly good, and it looks and sounds very nice, but as is the case with all these honourable mentions – this title lacks any distinguishing features that would make it stand out above mediocrity. If it had the excellent cut scenes from the first Pocket Monsters game or perhaps a bit of back story and an actual ending then things might be different, but as it is Pocket Monster 2 is just an average sidescroller, not terrible by any means, but not great either. Developed by Chinese pirates Glorysun Entertainment, Return of the King is actually a pirate of another pirated game – Chinese Fighter, aka Tenchi Wo Kurau 3, which itself is a pirate of the Capcom arcade release Tenchi Wo Kurau 2. Clearly, there is no honour among pirates as in between the swashbuckling, fancy-bird-wearing and CD burning they have no qualms about ripping each other off. The idea of a pirate of a pirate game is amusing enough on it’s own, but what makes this case particularly interesting is that the original source material, (Tenchi Wo Kurau 2) is actually a brawler. The pirate game that followed, Chinese Fighter, took the guts of that game and turned it into a one-on-one fighter. 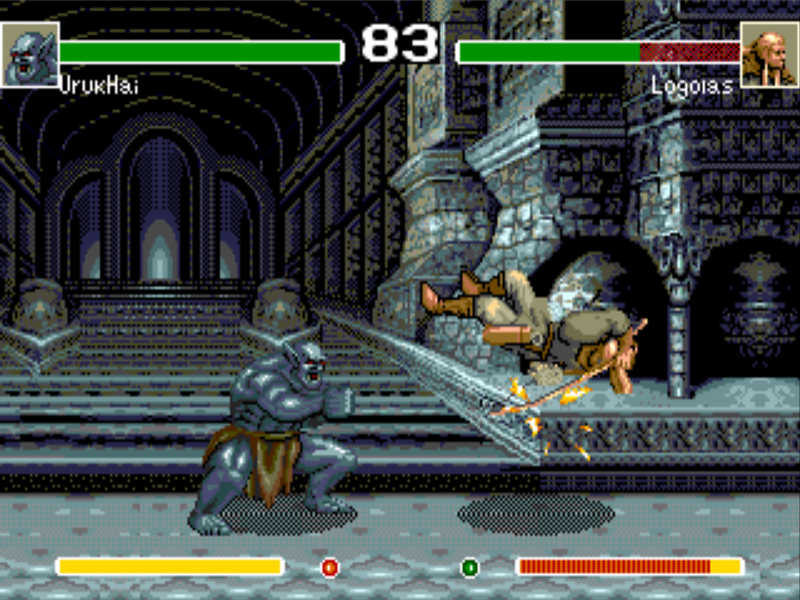 Then Return of the King took that and overhauled it into a Lord of the Rings-themed fighter… An interesting evolution via piracy. So how good is it? Well, it is by far the best pirated fighting game for the Sega Genesis, and while that may sound impressive it’s really like winning first prize at a turd sculpting contest. While some of the above-mentioned pirate titles are actually quite good, this blessing doesn’t extend to the fighting game genre. Pirated fighting games on the Genesis are such complete and utter crap. It’s a wonder that even Chinese bootleggers bother releasing them. Games like Soul Blade, King of Fighter ’98 or MK6 are so critically broken they can barely be classified as games, as they’re borderline unplayable. Return of the King rises far above that and presents an actual game that is complete with functional combat engine, good physics, decent visuals and sound, and an overall playability that puts it above all other pirated fighting games and many official releases. Above many official releases, you might wonder… Well it’s no big secret that the Genesis has a long list of fighters in its library, so let’s cut to the chase and examine how Return of the King stacks up against some of them. Return of the King is better than: Ballz, Time Killers, Slaughter Sport, Justice League Task Force, and Heavy Nova. It is not better than Street Fighter II, Eternal Champions, Samurai Shodown, Art of Fighting or Mortal Kombat. So it manages to hold its own against some titles that got an official release while still falling quite short of the genre’s best. Essentially, what you have is the bare bones of a fighting game; the engine works, it has decently animated characters with a good move set and some cool arenas, but that’s all there is. It feels a lot more like a proof of concept demo than a complete game. It lacks any story mode or even a decent arcade mode. Instead, arcade mode just has you fight all the characters, and since there aren’t that many you have to fight some of them multiple times. You do this enough times and the game ends, showing you a digitized picture of Aragorn along with the word “Congratulations.” Thankfully two-player vs. mode is still intact. So there you have it intrepid reader, proof that the beloved Genesis is nowhere near devoid of good pirate titles. So be brave, expand your horizons and check out some of these titles for a gaming experience that’s just a little different.